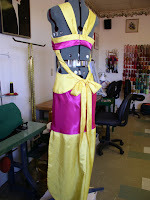 F irst delivered was this purple one, designed by the prom girl and her sister. White piping on all the edges. Crochet cotton makes good filling for piping. It was a challenge to get all the pieces where the girls wanted them. I reinforced the "side seam" with twill tape. Thank goodness it will only get worn once. The back goes all the way down to a whisper train. They brought in a picture, which was modified as we worked. I don't have to like the dress! Next up is a more modest dress. This was a combination of two RTW photos. I had to change the back a little to match the front she wanted. 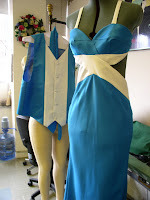 The dress is bias cut and the skirt is wider in back to give walking room. I'm much happier with this one. 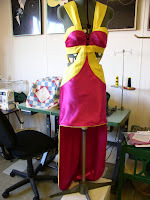 I en ded up hand sewing the curves and them machine stitching over the hand sewing. In the background is the vest and tie for her date. 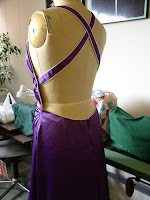 The third dress I made this year was made for a friend of the first two girls and had the same design input as the purple dress. We started with a cell phone image, which I insisted needed to be put on paper. The bra is connected in the front by crossed spaghetti ties. She originally wanted the skirt much shorter. No argument here, she just changed her mind when she put the dress on. The front hem is piped with dishcloth cotton inside. We had discussions about the train. I originally misunderstood what she had meant. This was a compromise. The train was too heavy to attach at the top of the skirt. No structure to hold the weight and that wasn't what she wanted anyway. The bow was a late addition. I hope she didn't get it tied too tightly. 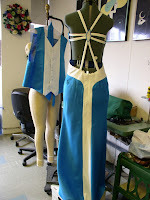 That di storts the upper skirt part. It is kind of cute as shown. I've been working on the shawl. All that sewing cut into knitting time, but it's coming along. The pattern will be easy to write, only two main charts. I don't know what's hiding in the computer right now as far as the charts go. The main lace pattern I'm working from needs a little tweaking. I charted the border lace and the corners with pencil and graph paper. that actually will be three small charts. 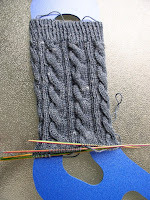 My April socks, which should be finished by May 30 to be eligible for prizes, probably won't be. Knitting time has been almost non-existent. I've wanted to make this pattern for a while, but it isn't a fast knit. I actually have one sock finished and am past the toe on the second. They're toe up, so that means I still have most of a sock to knit. The pattern is from a German designer who i recently discovered. My May socks are going to be a late birthday present for a son-in-law. This pattern is vintage. It's a faster knit, but lowest in priority. Our family get together was on Sunday. A daughter hosted and a great time was had by all. Today is a lazy day. I'm still trying to recover from all the late hours put into those dresses. If I do it again next year. I'll start late nights once a week or se as soon as I get the order and deposit. In case anyone cares, my phone problems resulted in a phone exchange. The new computer is working well, with a couple of problems still. Life is fairly good. the prom dresses leave me speechless. the girls have a "great"imagination on how to leave very "little" to the imagination. your sewing looks wonderful. not too sure about the girls' taste in design, though.